Living as long as you should. There was a birder at the park this morning. I spotted him as Lucy and I rounded the path. He was walking a bike. He occasionally stopped and lifted his binoculars and peered into a tree. He was wearing bike shorts and a helmet and was sporting large rubber band-like straps below his kneecaps. “Red tail?” I asked, sauntering past, a bird disappearing over the trees. “Kestrel,” he corrected. I moved on. He lingered. Lucy darted ahead. There is an unmatched quality to a Sunday early morning. I returned two books to shelves this week, actually, to be precise, one book to the shelf, one to the library. I have tried to read Angle of Repose Wallace Stenger’s 1971 Pulitzer-winning novel three times. I advanced almost two hundred pages this go ’round (out of 600) but decided to retrace my steps. It lacked a certain deeper context. Or rather, it–this context–escaped me. A book has to appeal on multiple levels. Angle of Repose seemed lacking in dimension. No doubt my problem, not the book’s. The other book, The Second Book of Tao, was poor timing. Some books, like some foods, require the necessary appetite. Bailing on a book no longer troubles me. 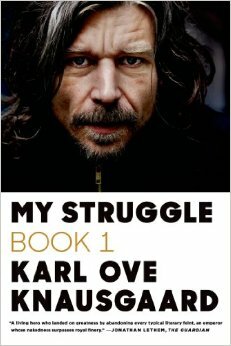 The last novel I devoured was the second book in the six book series, My Struggle, by Karl Ove Knausgaard. Like many other readers of this series (3000 pages! ), I cannot get enough, but cannot explain exactly why. Zadie Smith says she needs his books “like crack.” James Woods, writing in The New Yorker, says, [Knausgaard] wants us to inhabit the ordinariness of life, which is sometimes visionary…, sometimes banal…and sometimes momentous…but all of it perforce ordinary because it happens in the course of a life, and happens, in different forms, to everyone. He notices everything—too much, no doubt—but often lingers beautifully.” It feels time to get book three. I have the appetite. I cleaned out dad’s room the day after he died. All of his belongings packed into three grocery-store banana boxes and four trash bags. I took the bags of clothes to Good Will. The boxes remain in the back of my truck. Dad never read Thoreau, but he understood living simply. The sage lives as long as he should, not as long as he can, says Montaigne. Dad, unknowingly, was a great philosopher. I return from my morning walk with Lucy and declare to Carole that I don’t have a spiritual bone in my body. This is a revelation after years of fruitlessly attempting to cultivate a phantom desire, as if living up to a responsibility. “Do you mean religious bone in your body?” she asked. “No, I know I don’t have that,” I say. She nods and says it’s the same with her. We leave it at that. Know thyself, counseled the Greeks. Oh, I get it. This is a koan. You eloquently describe three deeply spiritual experiences and then conclude you have no spiritual bones. Not a koan but the ironic state of being human. But then maybe that is the ultimate koan.